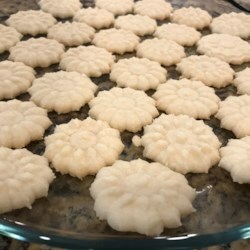 Excellent shortbread ccokies!! But be prepared when making these, the recipe says it makes 2 dozen and that's WAY off unless you're using some super **huge** cookie press! I get at least 6 dozen cookies out of one batch every time I make them!